Qualification/Experience: MBBS. Candidates with MD in Psychiatry/Diploma in Psychiatry Medicine will be preferred. The candidates must have valid registration with the concerned Medical Council. Place of posting: Opioid Substitution Therapy (OST) Centres for the Injecting Drug Users (IDU) located at Diphu Civil Hospital, Diphu Karbi Anglong. Qualification/Experience: B.Com with 5 years experience in procurement related works with computer literacy. 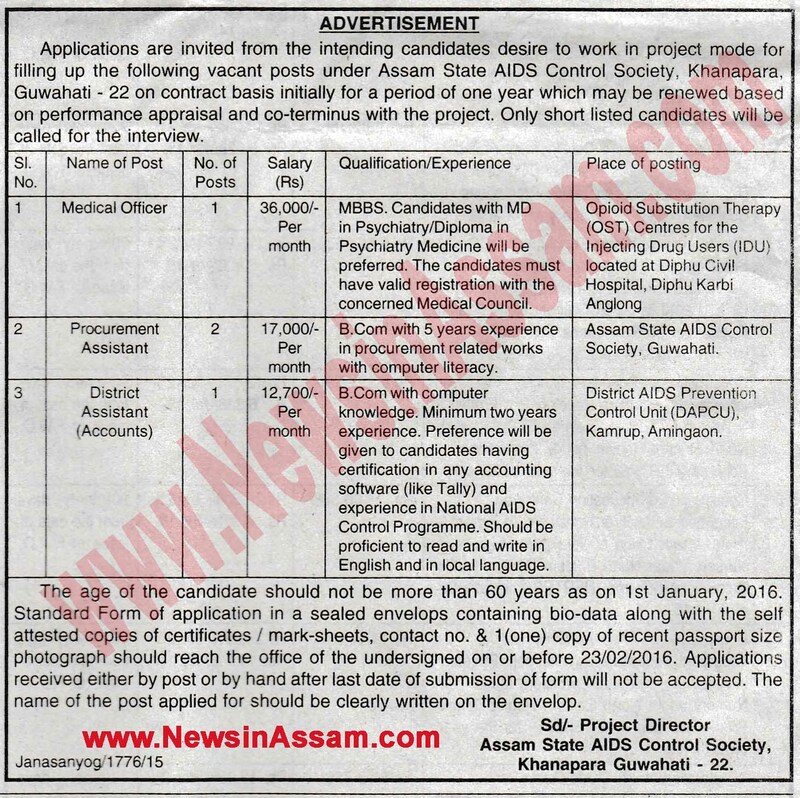 Place of posting: Assam State AIDS Control Society, Guwahati. Qualification/Experience: B.Com with computer knowledge. Minimum two years experience. Preference will be given to candidates having certification in any accounting software (like Tally) and experience in National AIDS Control Programme. Should be proficient to read and write in English and in local language. Age limit: The age of the candidate should not be more than 60 years as on 1st January, 2016. How to apply: Candidates for filling up Standard Form of application in a sealed envelops containing bio-data along with the self attested copies of certificates / mark-sheets, contact no. & 1 (one) copy of recent passport size- photograph should reach the office of the undersigned on or before 23/02/2016. Applications received either by post or by hand after last date of submission of form will not be accepted. The name of the post applied for should be clearly written on the envelop.